I look forward to the Thanksgiving/Advent season all year long, welcoming the shorter days, the candlelight and handmade crafts and food, the warm drinks and countdown to Christmas. When it comes to gift-giving, I am one-part intentional, one-part pragmatic, meaning my favorite gifts are both meaningful and useful. The thought of gifts that might easily break or quickly pass with a trend or carelessly add to the clutter of our spaces ties my stomach in knots. So Mark and I hold to a simple process for support: we set a specific budget, make notes of needs, curiosities, and interests growing within our children that we want to support, and begin planning. It is incredible how quickly gift ideas rise to the surface with this approach, but also how many goods are quickly disqualified, too. Of course, because they are human, our children sometimes have their own wishlists to share with us, perhaps roller blades or a sewing machine, which we always consider, too. Wink. If you’re curious to read more about our gift giving philosophy, I encourage you to read through the older guides linked below as I share more in them. This is the fourth year for me to share this gift guide, something I really enjoy sharing in this space and one that is often requested throughout the year. Although it is labeled for the homeschool, the ideas are clearly not restricted to homeschoolers but are a collection of books and goods to support creativity and ingenuity, just like our homeschool. I’m quite certain this is not the first or last gift guide to wander across your screen this weekend, but I hope this one inspires you just the same. For those of you who are new to space, I encourage you to sift back through the previous three guides for ideas, too, as each list builds upon the other. Enjoy, and happy Thanksgiving! Thank you Hannah Walls for your research help on this post. This post contains some affiliate links. Cloistered Away might receive a small commision on the goods purchased through those links. Although I do have a few things ready for this upcoming weekend, I seem to be lagging behind the entire holiday season this year. I find the term procrastinator doesn’t suit well, as it implies I’ve been intentionally avoiding the thoughtfulness of the season. It turns out, the logistical mess of our lives this Fall has meandered into this part of the year as well. Again, I’m learning to be gentle with myself and our home, to take a deep breath and prepare for an intentional reset beginning next week. In the meantime, I have gifts to purchase and wrap and bags to pack like many of you, so at the moment, I’m feeling grateful for free two day shipping. For those of you in the same place today, I thought I’d share a few favorites for the adults on our lists. Peace to your efforts and cheers to thoughtful gifting, even in the last minutes. Wink. Timex Southview Watch | Something handsome for the one with classic, understated style. Wood Soup Bowl Set | Something functional and warm for the one with open shelves or glass cabinets in the kitchen. Brass Chamberstick Candlestick Holder | Something romantic for the late-night artist, the early morning reader, or the gracious host. Pair with a set of these candles. Barebones Living Small Garden Scissors | Something small for the one always lost in the garden. Honeycat Lariat Dropbar Necklace | Something pretty for the one always borrowing your favorite necklace. Felt Laptop Case | Something practical for the one who commutes. Wabi Sabi Welcome | Something reassuring for the one who feels imperfect. Barbones Living Beacon Light | Something bright for the one who loves the outdoors. The Haven’s Kitchen Cooking School | Something helpful for the one who wants to learn. Bose Micro Waterproof Bluetooth Speaker | Something portable for the one who loves to move. Everlane Cashmere Scarf | Something cheerful and cozy for the one who despises the grey winter. betterfelt Classic Wool Slipper | Something meaningful and utilitarian for the one with cold feet. Mkono Himmeli Hanging Planter with Ceramic Plant Holder | Something unexpected for the one who dreams of greenhouses. Nikon 50mm f/1.4G Lens | Something perfect for the aspiring photographer. Matryoshka Ceramic Measuring Cups | Something unique for the one always in the kitchen. Afghanistan | Something stunning for the world traveler or photographer. Phone Tripod and Remote | Something useful for the DIYer, blogger, or online socialite. Everlane Leather Foldover Crossbody | Something special for the one who means most. Mother’s Day is this weekend in the US, and although it seems there is now a day to celebrate all sorts of things, of course this one and Father’s Day feel most precious. As both a daughter and a mother, I love that we have a day set apart to say thank you, to remind these precious women in our lives that they matter. I’m not quite sure what this weekend will look like for us yet, but if you’re looking for a few ideas in how to celebrate (or pass along to someone else–wink), here’s a few favorite ideas below. Happy Mother’s Day! If mom is generally the one feeding others, it will certainly gift her to have someone else prepare something tasty for her instead this Sunday morning. For most any mother, breakfast in bed with a favorite book or magazine will feel luxurious, more like a bed and breakfast than a typical morning at home. Consider sesame toast with a poached egg and greens or lavender french toast or a grain-free cherry crumble or of course my favorite blueberry scones. For a simpler option, run to get her favorite coffee or make a mimosa. Family brunch is another popular idea, and a fun way to include all the kids in preparation. For this option, consider something simpler to eat, like banana-blueberry pancakes or yogurt-granola parfait. Of course, even a morning out at her favorite eatery can be special. Check ahead to make a reservation as it’s a popular option. For the woman who appreciates nature and plant life, plan to spend the day outdoors. Pack a picnic and head to a local flower garden or park. Consider these secrets for the perfect picnic or take this simple idea and create a beautiful spread in the backyard. Last year, I spent the day planting flowers in our beds on Mother’s Day, so possibly a trip to a local greenhouse or giving her time to work in the garden at home (alone or together, depending) might be a gift, too. Some women feel most at rest playing outdoors. Consider places you don’t typically go together. Would she love a day trip rock climbing or hiking or kayaking? Consider taking a family bike ride or offering her a day to herself to hike or ride on her own. last-minute gift ideas | If there isn’t anything specific she needs, give the gift of experience here. Wink. We tend to keep the holiday season in our home fairly simple in terms of gift giving, both the quantity and expense. This isn’t from a desire to be Scrooge-like or withholding, but instead another way we’ve learned over the years to simplify, to stay within our financial means, and to help keep our home filled with fewer things we really enjoy and can manage well. Living in a small home has taught me a valuable life lesson: less really can be more, but it means making tough decisions. Buying less, means I choose something far more carefully. My husband and I often pick high quality gifts, something that can easily be passed down between siblings, family, or friends when they’ve outgrown it. We also love giving gifts that engage their interest and skill sets, tools that can double for our home school experience, too. Over the last few weeks, I’ve received a few emails and comments and texts from other parents asking about Christmas gifts for their own homes, wondering what we’re getting our children or asking about our favorite books or toys or nature books. Although it took me a bit of time to collect a few, I created this gift guide as a way to share both our favorite learning tools and ones still on our wishlist. I added “gifts of experience” section to each category, because often we have given experience over things to our children for Christmas or their birthday. It can be a fantastic way to give something meaningful without carting more things into your home or when finances are a little tighter. Clearly, this is not a finite list, nor is it strictly for the homeschool or Christmas season, but I hope it in itself is a tool of inspiration. Enjoy. 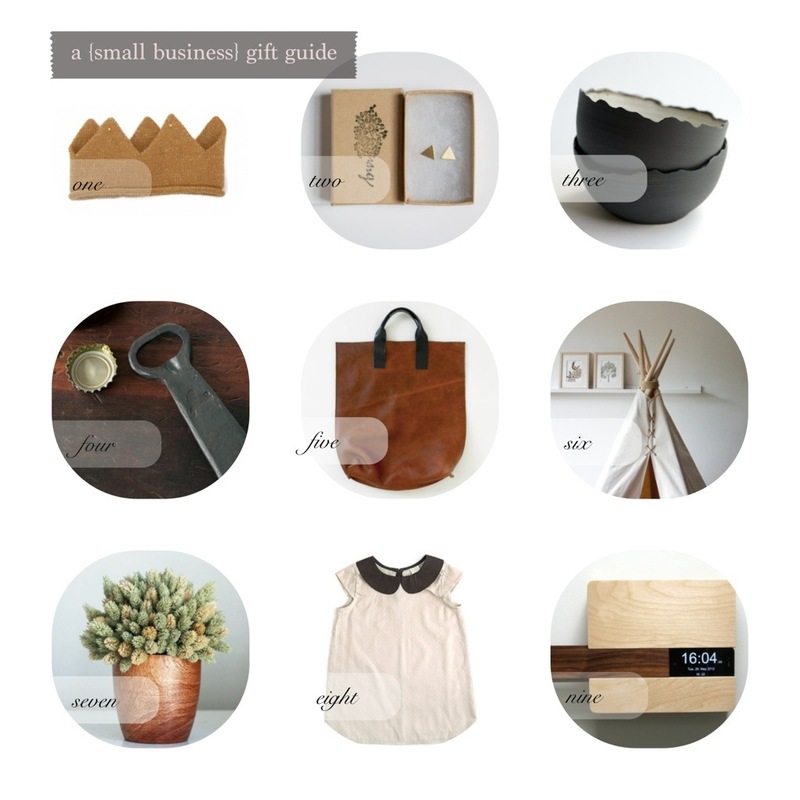 In honor of Small Business Saturday, a day promoted by American Express to support small businesses around the globe, I’m sharing a few of my favorite gift ideas for made or sold by small businesses/creatives. 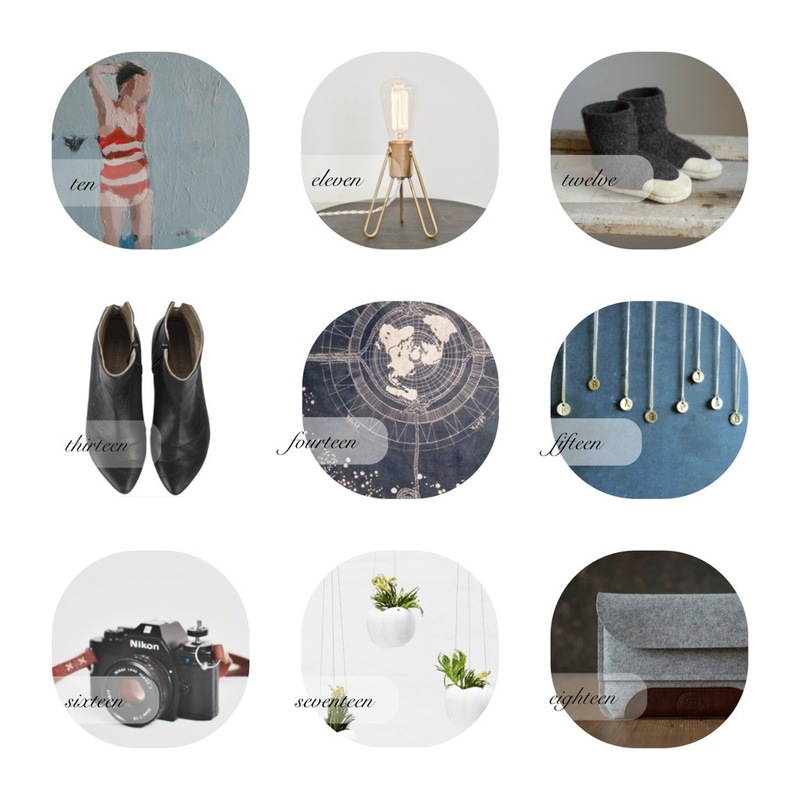 I hope they inspire you to shop small this season.